The second installment in our epic Starbound trilogy introduces a new pair of star-crossed lovers on two sides of a bloody war. I definitely recommend that you do so. Seriously, the book was fantastic. 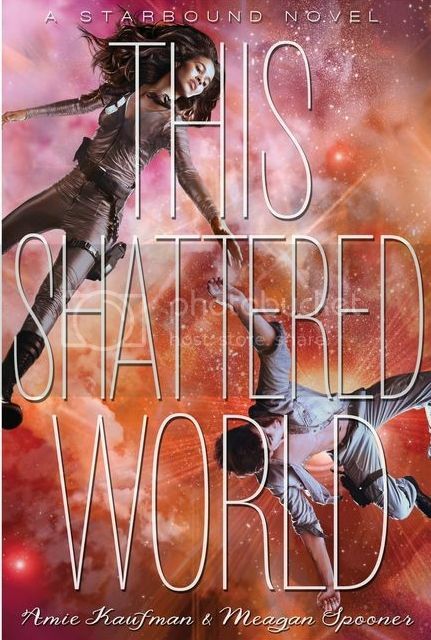 I'm ECSTATIC to see the cover for This Shattered World!! The synopsis for the book sounds amazing. I can't wait to get back into this world. I haven't read These Broken Stars yet, but it's on my TBR. I like the cover, very unusual! I loved These Broken Stars as well, so I can't wait to get my hands on a copy of this one. I hope it's just as good! Great pick! The guy looks awkward but pretty cover. I love the background! These Broken Stars was alright for me so I'll probably read this one too. I was hoping to hear more from Lilac and Tarver, so I'm kind of disappointed to hear that they're introducing a new pair. I LOVED the first book and can't wait for this one. Love when they keep the same cover theme, too. I miss the flow-y dress but this new female MC looks like she can hold her own in a firefight! I have been seeing this one a lot this week. The cover is beautiful. I hope to get my hands on this book very soon.